Not an auspicious beginning for a revolution, wouldn’t you say? But the post also resulted in several emails in my inbox. Here are three stories from those emails about young people with a different perspective –– a teen rock band called One Eyed Rhyno from Sacramento, California; climate students from the North Cascades Institute in Sedrow–Woolley, Washington; and a bicyclist from the Yukon province in Canada. On September 22, I received an email from Two Sheps that Pass, a marketing agency in New York City. Normally, such an email would sit in my inbox for a few days before I’d get to it. But in this case, I responded within an hour because I found the subject line intriguing. “Teen Band One Eyed Rhyno Rocks to Raise Awareness and Funds for Gulf Spill,” it said. The band has been compared to Led Zeppelin –– I love rock music, and Led Zeppelin is one of my all–time favorite rock bands. I saw the Page–Plant reunion concert in Las Cruces, New Mexico. One Eyed Rhyno released a single entitled “The Bird,” which addresses the devastating and deadly conditions that impact wildlife after an oil spill. “The Bird” reminded me of Albert Pinkham Ryder’s painting, “Dead Bird,” which I’ve long been interested in since I first encountered it in a reproduction. He painted this unusually small (4 3/8" x 10") and representative –– not his oeuvre –– work sometime during the 1890s. Ryder’s masterpiece is the most affecting painting I’ve ever come across that evokes the pain and suffering of a dying bird. So I was curious. I clicked the link to the music video of “The Bird.” Powerful music; I was hooked. I went to their Myspace page and watched all nine music videos they’ve posted. In India, I grew up with the unforgettable melodious voices of Mohammad Rafi, Lata Mangeskar, Kishore Kumar, and Mukesh. I’m no music critic, but when James sings “Name” or his sister Elaine sings “Sea of Love,” I feel these voices are hauntingly melodious. And when he sings “Amelia,” “Armaggedon,” and “Rooster,” he reminds me of a young Neil Young – engrossed and lost in the song he is singing. And then I listen to “My Side,” “Capless,” and “The Bird,” their vibrant youth energy burst out. For a while, I was so lost in the music that I forgot these kids have anything to do with the environment. It actually didn’t matter to me because I loved their music. Then I returned and listed to “The Bird” again, and again. In 2004, James Hunter was 9 years old and his big sister Elaine was 12. They were psyched by Jack Black’s movie The School of Rock and wanted to create a band of their own. So they did, for a school talent show. And the name? James had visited the San Diego Zoo and thought rhinoceros is the coolest animal on the planet. Elaine thought rhinos fight and sometimes one of them might loose an eye. That was the birth of One Eyed Rhyno. Since then they've been rocking with a purpose to save the planet –– not unlike a charging one eyed rhino who is determined to do something. After BP’s oil–and–methane spill in the Gulf of Mexico this year, James (now 16), Elaine (18), and their long-time friend Andrew Daniels (17) recorded “The Bird,” with James as the lead singer and guitarist, Elaine on drums and vocal, and Andrew on bass. “The Bird” was featured on the “Weekend without Oil” campaign of DoSomething.org –– “one of the largest organizations in the US that helps young people rock causes they care about” –– and in a blog piece called “Singing in support of wildlife” in The Defenders of Wildlife, a prominent national conservation organization. One Eyed Rhyno is donating 100 percent of their proceeds for gulf restoration projects to The Student Conservation Association (SCA), which “builds new generations of conservation leaders and inspires lifelong stewardship by engaging young people in hands-on service to the land.” I talked to the band members over the phone recently and asked them why they decided to donate the funds. They responded, “We’re young. We don’t have much time, we have to do everything we can right now.” They told me they have events planned with SCA through Earth Day 2011. Where does the passion for environmental conservation and volunteerism come from for these teens? In 2005, 2006, and 2007, they participated in the Creek Week in Sacramento, their hometown, a local effort to clean up creeks. They recounted one experience of finding the carcass of a bird. They were strongly affected as they learned about global environmental problems through local volunteerism. But they also fondly remember at the end of each of these weeks that there was good food and music, and, sure enough, they performed each time. Now they say they want their music to inspire youth across the world to participate in creating a healthier planet for their generation. During most of the phone call they talked about saving the environment. It was only after the call that I found out that One Eyed Rhyno had taken first place in the Contemporary Music category at the 2010 Jammies, Sacramento’s Youth Music Competition. Bono, Leo, Letterman, Leno – pay attention to One Eyed Rhyno. They’ve got tremendous potential to inspire their generation. Give them a little nudge, and they’ll fly! 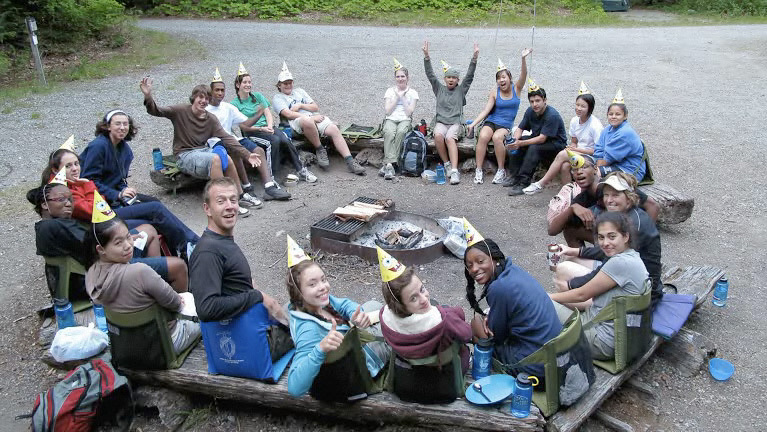 In 2009, the inaugural year of the program, NCI brought 19 urban high school youth from five cities across the country – Chicago, Denver, San Francisco, Seattle, and Washington, DC. They were selected on the basis of teacher recommendations, service and leadership experience, an essay application, and personal interview. They spent the month of July in the North Cascades camping, hiking, and learning about climate change. In September, they traveled to Washington, DC, and presented these ideas to decision-makers. In October and November the students worked with teachers and partners from their local National Park units to bring climate change awareness into the elementary schools, engage more youth, and provide opportunities for service and action. In late August I wrote a piece on how bark beetles are killing forests all across the world due to global warming. And because of this, some boreal forests in British Columbia and Yukon provinces in Canada have already turned from being a carbon sink to a carbon source. But I did not point out then that tar sands oil production in Alberta, Canada, is a major killer of boreal forests, contributing significantly to climate change. If you’re interested, you can check out this report, “Tar Sands and Boreal Forest” from Greenpeace [pdf 2 pages]. Right now, the U.S. is considering approval of the massive Keystone XL pipeline project to bring tar sands crude from Alberta all the way down to Texas and the Gulf Coast refineries. Several U.S. congressional delegations have recently visited Canada to learn about tar sands oil. Earlier last month Speaker Nancy Pelosi (D–CA) gave vague soothing comments to both sides after her visit there with Representative Ed Markey (D–MA). Most recently, Senator Lindsey Graham (R–SC) said the tar sands oil field “really blends with the natural habitat” after his visit there with Saxby Chambliss (R–GA) and Kay Hagan (D–NC). You’d have to be really ‘high’ to make a statement like that about tar sands and natural habitat––Senator Graham must have been looking at those fields from a very high altitude, where everything peacefully blends into a holistic picture. I suggest you take a look at these photos from a low altitude, no more than table high, and then decide for yourself. As I was finishing this piece I saw an ad that said, “Tell it like it is,” on Huffington Post. It was posted by the Government of Alberta, Canada, to promote tar sands oil production. The question is: To whom should we listen about the devastating impacts of tar sands oil – the inexperienced Canadian youth Malkolm Boothroyd from Yukon or the experienced Canadian politicians from Alberta? 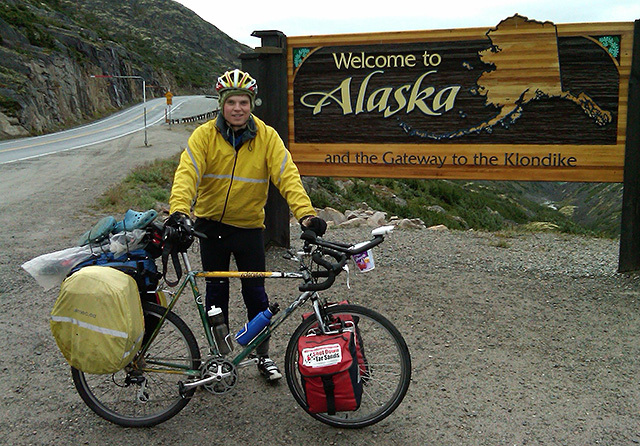 Malkolm writes in his blog that he is now cycling from Alaska to Washington, D.C., and then continuing on to the U.N. Climate Change conference in Cancun in December. He is riding solo from Alaska to Missoula, Montana, where he will meet up with other people and continue on. I learned from a letter that he wrote to his family before he started his journey that his ride is part of several larger initiatives: in Minneapolis he’ll take part in the ‘Global Work Party’ on 10/10/10; his journey is part of the Canadian Youth Climate Coalition, which is “a united front of youth from across Canada tackling the biggest challenge of our generation, the emerging climate crisis”; and he is excited to have been selected as one of 25 youths for the Canadian Youth Delegation to Cancun. See what I mean by his direct gaze toward us in that photo? It’s no surprise that Malkolm is doing imagine–talking with Harper during his bike ride. Last year Canada ranked last among the G8 nations on climate change action. I’m sure you’re wondering: How did U.S. fare? A whopping 7th place. I bet both Canada and U.S. will be vying for the last two spots again this year. Isn’t it amazing that a youth in the far northern Yukon province of Canada and a group of urban youths from Sacramento, California, are independently talking about climate change, doing something about it, and raising money to donate for conservation? It makes me wonder how effective the leaders of big U.S. charitable environmental organizations (whose salaries are far more than any U.S. Senator, the Speaker of the House, the Vice President, and near and sometimes exceeding that of the U.S. President) have been on climate change. Nothing we can write home about. I’m also certain that the climate deniers will soon be asking for pay raises from Big Oil and Big Coal after the recent loud announcement that “Big Green CEOs Earn More Than Climate Deniers.” There was a time when mountains, forests, and deserts were places where Green leaders felt safe and comfortable to walk on and so they passionately fought for the protection of those places. Those times are gone. But I think right now the Big Green CEOs ought to reduce their salaries to no more than that of a U.S. Senator, and that would be fair, unless Wall Street is the only street they feel safe and comfortable to walk on. While you’re contemplating that, I’ll return to Malkolm. 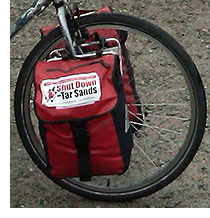 In 2009, he biked more than 5,000 km, from Whitehorse, Yukon, to Ottawa, Ontario, as part of Pedal for the Planet. When the group got to Ottawa, the Harper government refused to meet with the young cyclists. Does that remind you of a recent episode when Bill McKibben and young students arrived in D.C. with their “put solar panels on the White House roof” proposal? Malkolm began his current journey in Alaska, a place that has become like a second home for me through my decade–long work on Arctic Alaska issues. So I was curious about youth and climate change in Alaska. Two weekends ago, as I started writing this piece, the Alaska Youth for Environmental Action was finishing their Youth Climate Change Summit. These are three isolated stories that came into my inbox through the blogosphere. I’m sure there are thousands of others like these all over the world that I do not know about. These youth are quietly doing things that may not seem like a climate revolution to you, but to me it sure smells like kindling. If we elders support and educate our youth now, I bet in 10 years there will be many big fires! [Note for readers: I’d like to thank James and Elaine Hunter, and Andrew Daniels of One Eyed Rhyno, Drew Citron of Two Sheps that Pass, Megan McGinty of North Cascades Institute, fellow conservationist Christianne Hinks for bringing Malkolm Boothroyd’s journey to my attention, and senior editor of ClimateStoryTellers.org Christine Clifton–Thornton. Subhankar Banerjee is founder of ClimateStoryTellers.org. He is an Indian born American photographer, writer and activist. Over the past decade he has been a leading international voice on issues of arctic conservation, indigenous human rights, and global warming, and over the past five years he has also been focusing on forest deaths from global warming. He received many awards, including Lannan Foundation Cultural Freedom Fellowship. Subhankar is currently editing an anthology titled, “Arctic Voices“ (New York: Seven Stories Press, 2012) and has been appointed Director’s Visitor at the Institute for Advanced Study at Princeton for fall term 2011.